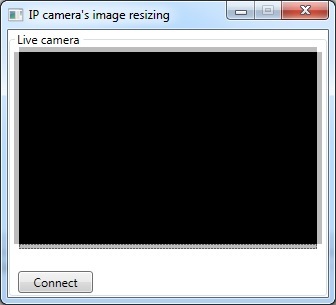 On this webpage you will find detailed information on how to resize the image of an IP camera. To implement this example, you need to have OZEKI Camera SDK installed, and a reference to OzekiSDK.dll should be added to your Visual Studio project. 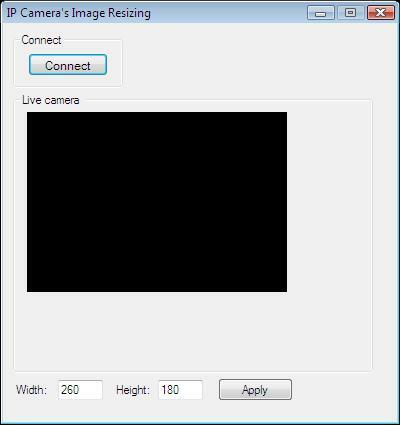 How to resize the captured image of an IP camera device using C#? button_Apply_Click(): this is the only additional method of this example. The method belongs to the "Apply" button on the Graphical User Interface, which is also a new component. The method has been implemented in order to react properly to the click event of the new button. Left to the button we can see the necessary GUI elements that can be used to give the new size parameters of the camera's image. Finally, we have to mention that if the code handles incorrect values it gives an error message or adjusts the given size to the allowed maximum/minimum automatically. To establish the connection properly between your application and an IP camera you should apply the same code snippet what you have used in the example (How to connect to an IP camera device using C#?). Important: you should study this article in order to find out how to setup your WPF correctly. You can resize the camera's image as you want with four GridSplitter WPF controls what you can find in the MainWindow.xaml code. I tried to provide larger/smaller values to the width/height, but it does not work. Why? These values depend on the following: mindwidth variable, minheight variable, and the Width and Height properties of the CameraBox so that the changes should be performed on these values.